"...the service has been phenomenal. I couldn't be more pleased..."
Our client, Lonnie, was rear ended in a car accident on Interstate 5 in 2010. He suffered injuries as a result. In the video above, he describes his interaction with the insurance adjuster and how attorney Chris Davis' book, "The Ten Biggest Mistakes That Can Wreck Your Washington Accident Case" helped him. The insurance company offered a low-ball amount, and Lonnie hired Davis Law Group, P.S. to help him get the maximum compensation possible. I was involved in a rear end accident December 9th of 2010 when I was traveling on I-5 and traffic came to a stop, and I got rear-ended. Lady was doing about 40 miles an hour, and not only did I get rear ended, she got rear ended, too. She got rear ended by the Washington State Patrol, which caused her to hit me again. And that's what kind of got me to the Davis Law Group. 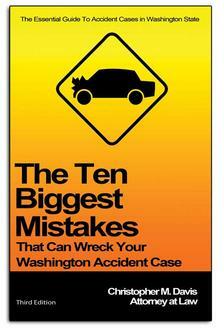 I sent for the book 10 ways to ruin your accident of Washington State, and I read that book. And so when I met with the insurance agents from Farmers Insurance, I was kind of prepared for how he was going to present himself. And so our first meeting, it was almost hilarious where he says, "well your accident's not worth that much and I'm here to settle this accident." So I'm like, "what are you here to settle for?" He says, "Well, I've been told to give you five hundred dollars for your damages and your injury." And I kind of laughed. I pulled up that book and showed him. I said, "you know I read this book this morning and it said you were going to come do this very thing that you’re doing. And I said, "all you've done is send me to Davis Law Group," and that's how I got here. That this guy came and just approached me so wrong. I was in physical therapy, I had got a cut on my eye. Turns out I had blown my rotator cuff in my left shoulder. And he's sitting there looking at me saying, "you can make me an offer at 500, up it fifty dollars for the cut on my eye." That's what got me here. The case was handled great. It took a little time because Washington State Patrol didn't want to admit any guilt, but through determination and perseverance by the Davis Law Group, they finally admitted that there was some wrong on the Washington State Patrol because he caused the lady to hit me again. I was telling Rory this morning that I changed my route to work just I could give you guys a shout out every morning. Driving past the building I yell out, "come on Law Group." I have been doing that for two years. Everyone that I know that's gotten into an accident, they start talking about it. I tell them, "hey get this book." I say, "get this book and read it before you do anything. This book is going to tell you exactly how that insurance adjuster is going to come at you. And I say it tells you that that insurance adjuster works for an insurance company, it's not your friend. Service has been phenomenal. I can't be any more pleased than I am this morning.